Analog Artist Digital World: The Orlando Sketch Tour explores color. 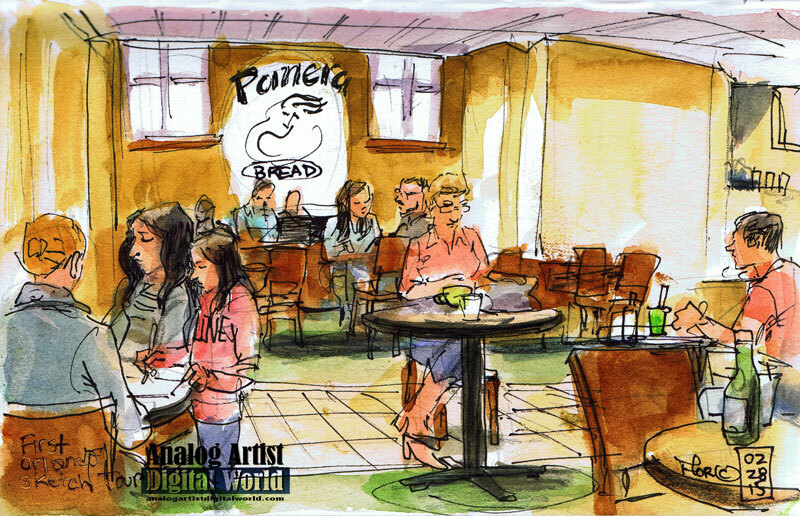 At the First Orlando Sketch Tour we were chased inside Panera Bread thanks to impending rain. Kelly Medford and myself made the best of it and the restaurant became our classroom. Here we introduced everyone to the watercolor pallets we had supplied each artist with. We asked everyone to make a color wheel and then to make a light watery wash of each color along side a dark, syrupy wash of the same color. When working on location, I seldom have the time to mix colors, so I mix color washes on the sketch to find the colors and values needed. A sketch always starts out light and then I keep adding pigments to build up the darks. Trying to cover the whole surface except for a few white spots is the first objective. On this day, students from Elite Animation Academy came out to join the Sketch Tour artists. My wife Terry also came out to show her support. She is in the center of the sketch in the pink cowboy boots reading a magazine. Her signature sketch is a smiley face and she can finish that in five seconds. Shelby brought her daughter on the tour and together they discovered color and how to compose a sketch. That seems like the perfect way for a family to spend time together. My Elite Urban Sketching students were well into their studies so I let them sketch in peace offering just a few suggestions if they needed help. Between the eight or so Sketch Tour artists and the four Elite Animation students, we pretty much filled up the front room at Panera Bread. A little rain never stops an Urban Sketcher.